Due to recent events, our family time this weekend seemed even more special to me. And we had quite a bit of it! Friday evening, Mike and James went to see The Hobbit, so I took the girls to Rise of the Guardians. The BIG theater was crazy busy, so we went to the GHOST theater. There were a total of 7 people watching the movie. It was a good flick. Saturday, we dropped the girls off for Christmas Play dress rehearsal, then Mike and I did a little shopping then headed over to a Holiday get-together thrown by my friends Beverly and Robert. We enjoyed some wonderful southern cookin'! Saturday evening we watched How the Grinch Stole Christmas and I actually made something I pinned from Pinterest! 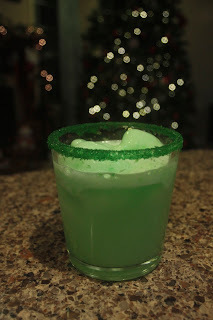 The Grinch Drink. I made mine a little different than the one on Pinterest which called for Jones Green Apple soda and vanilla ice cream. I wet the rim of the glass and dipped in green sugar crystals. Then I just added lime sherbet and sprite and that was it! The girls seemed to love it! After they went to bed we watched Christmas Vacation and the guys pulled out the Moose glasses and enjoyed some Egg Nog. Sunday morning, Mike made Rudolph pancakes. Then we headed to church for the Christmas Play. The title was Fear Not Factor and it was about angels getting their assignments during the time of the birth of Jesus. Our Pastor said he learned that Heaven was in Arkansas because where else would angels wear camouflage and cowboy boots. Sunday afternoon, we all went to the Girl Scout meeting for the family gingerbread house making event. So much candy! I ended the evening helping Addie learn to Cast On a knitting needle and making these Cream Cheese Cookie Jewels for the teachers and staff at her school. It is one of the winning recipes in the newspaper cookie contest. You can find the recipe here.